Clintonville, WI – November 2017 – CTK Precision, a manufacturer of innovative shooting equipment and gun accessories, is excited to offer a new buy now, pay later option for online shoppers. 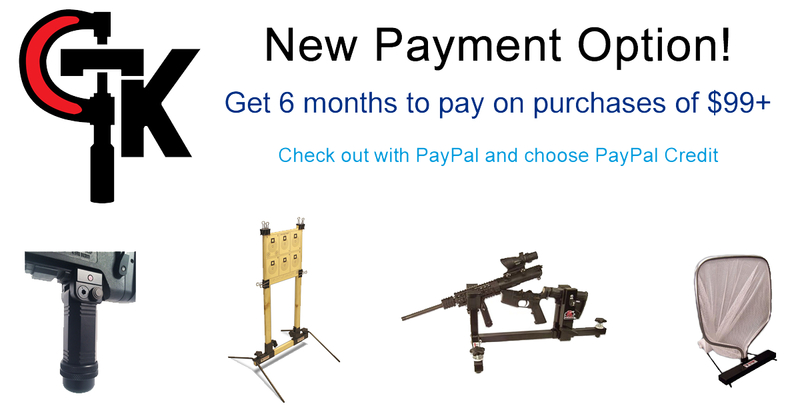 CTK Precision now offers shoppers the option to pay with PayPal, including PayPal Credit. For those unfamiliar with PayPal Credit, this option gives shoppers the benefit of no payments and no interest on purchases over $99, if paid in full in 6 months. Add desired products to shopping cart. Checkout with PayPal. Choose PayPal Credit as your payment option. Apply for PayPal Credit. Upon approval, your order will be on its way. For more information about CTK Precision, please visit www.ctkprecision.com and follow us on Facebook, Instagram, and Twitter. CTK Precision is a U.S. based manufacturer of shooting equipment and gun accessories. Their products are designed to maximize firearm efficiency, giving shooters more accuracy and range time. See the full lineup of CTK Precision products at www.ctkprecision.com.